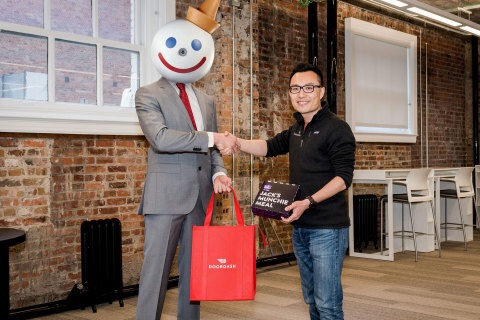 This past October marked the initial launch of Jack in the Box ® and top delivery platform DoorDash's partnership in the San Francisco market. This past October marked the initial launch of Jack in the Box ® and top delivery platform DoorDash's partnership in the San Francisco market. After the partnership pilot, the pair are rolling out an expanded partnership, now offering delivery in more than 200 cities across 14 NEW markets. Top markets include Los Angeles, San Diego, Las Vegas, Dallas/Ft. Worth, Houston, Phoenix, Seattle and Denver - with continued rapid expansion and more cities planned to join later this year. With new markets on-board, DoorDash customers now have access to Jack in the Box's entire menu of craveable food that can be delivered directly to their doorsteps as late as 1 a.m., and until 3 a.m. in select locations. To kick off this bolstered relationship, DoorDash and Jack in the Box are working together to "crash your cravings." That's right - night owls can now experience Jack in the Box's Late Night Menu with just a tap on the DoorDash app or click on the website. The hot-ticket item? The Sriracha Curly Fry Burger, the newest addition to Jack's Munchie Meals ® menu, which features a Jumbo Jack ® cheeseburger stacked with Seasoned curly fries and a layer of creamy Sriracha sauce. The Munchie Meal is complete with two tasty tacos, halfsie fries and a drink - all for just $6 from 9 p.m.- 5 a.m., $8 at other times during the day. Price and participation may vary. More of an early bird? The DoorDash app can take your lunch to the next level with delivery of the NEW Guacamole & Bacon Chicken Sandwich, featuring creamy guacamole, Homestyle crispy 100% all white meat chicken, Pepper Jack cheese and hickory smoked bacon, all on a buttery bakery bun - on-menu for a limited time only! Or, if you're hankering for something in the middle of the day, just click for Jack's Brunchfast™ Menu, with sweet and savory options delivered straight to your door. No matter what you crave, one thing's for sure - Jack in the Box and DoorDash will crash your cravings - any place, any time. Additionally, Jack's newest TV spot brings its "If You Crave It, We Serve It" campaign to life, with the ultimate crave-crashing vehicle, the Crave Van. Jack in the Box will also be airing its DoorDash delivery TV spot, " Gamer," across many of these markets to share the joy of delivery with anyone who needs a late night snack. "Jack in the Box has epitomized variety and choice for guests throughout its existence," said Iwona Alter, Chief Marketing Officer for Jack in the Box. "We're proud to serve our entire menu, all day, every day - and we wanted to bring that message to life. Our expanded partnership with DoorDash now offers guests the choice - come join us in-restaurant or get your cravings delivered to your door. Anytime you crave it, we'll serve it." "Whether you're up late working on a project or just need a snack in the middle of the day, Jack in the Box delivery is the perfect addition to DoorDash's selection of top restaurants," said Prahar Shah, Head of Business Development at DoorDash. "DoorDash is winning in on-demand delivery, in part because of our great partners like Jack in the Box. After months piloting with Jack in the Box in San Francisco, we've made delivery from their restaurants even faster, easier and simpler, and we are excited to be taking this partnership to the next level." For more information on Jack in the Box, visit jackinthebox.com, and connect with Jack on Facebook, Twitter, Instagram, and YouTube. To get started with Jack in the Box delivery, visit http://www.doordash.com/jackinthebox or download the DoorDash app for Android or iOS. Jack in the Box Inc. (NASDAQ:JACK), based in San Diego, is a restaurant company that operates and franchises Jack in the Box ® restaurants, one of the nation's largest hamburger chains, with more than 2,200 restaurants in 21 states and Guam. Additionally, through a wholly owned subsidiary, the company operates and franchises Qdoba Mexican Eats ®, a leader in fast-casual dining, with more than 700 restaurants in 47 states, the District of Columbia and Canada. For more information on Jack in the Box and Qdoba, including franchising opportunities, visit www.jackinthebox.com or www.qdoba.com. DoorDash is a technology company that connects customers with their favorite local and national businesses in more than 350 cities across the United States and Canada. Founded in the summer of 2013, DoorDash empowers merchants to grow their businesses by offering on-demand delivery, data-driven insights, and better in-store efficiency, providing delightful experiences from door to door. By building the last mile delivery infrastructure for local cities, DoorDash is bringing communities closer, one doorstep at a time. Read more on the DoorDash blog or at www.doordash.com.